“The way that Feonic creates sound is very different from the traditional electro-mechanical actuators and speaker based systems that you will have come across in the past. Instead of using a moving coil and magnet we use a really powerful smart material to deliver a micro-vibration of around 20 microns (half a human hair) to deliver a bandwidth of 80Hz – 20KHz when driving a resonant panel – i.e. a window. A traditional actuator or speaker would require a vibration of over 2000microns to achieve the same result at 80Hz”, explains Brian Smith, Design Director at Feonic Limited. “The Sound Shower is a directional in-ceiling speaker that is audible to customers within a defined radius of up to 200 meters in the store. 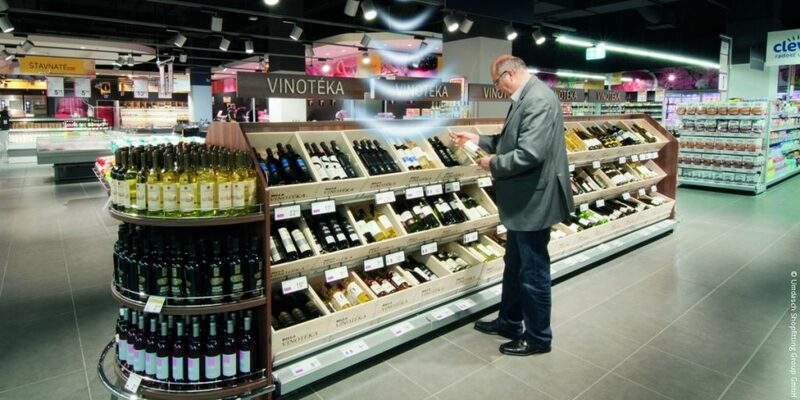 The sound shower is controlled with the help of a content management system,” says Bernd Albl, Managing Director Division viBIZ-Digital at Umdasch Shopfitting.